One duck shooting weekend we returned home to find that all had not gone well for the shooters on our property and one had gone to hospital in an ambulance. This weekend, all went well. More than 100 ducks were shot on one of our dams, a much-needed cull of the birds which contribute massively to a degradation in water quality. The shooters had fun and none was injured and I’m grateful for that. Cuggermugger – someone who gossips behind someone’s back; whispered gossip. I don’t have many vices beyond caring what other people think, she said, but that’s a big one. – Beyond Caring – © 2018 Brian Andreas – posted with permission. Sunday’s soapbox is yours to use as you will – within the bounds of decency and absence of defamation. You’re welcome to look backwards or forwards, discuss issues of the moment, to pontificate, ponder or point us to something of interest, to educate, elucidate or entertain, amuse, bemuse or simply muse, but not abuse. 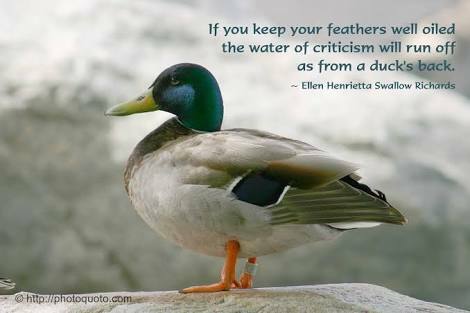 If you keep your feathers well oiled the water of criticism will run off as from a duck’s back – Ellen Henrietta Swallow Richards. 1527 Spanish and German troops sacked Rome; 147 Swiss Guards, including their commander, died fighting the forces of Charles V in order to allow Pope Clement VII to escape into Castel Sant’Angelo. 1536 King Henry VIII ordered English language Bibles be placed in every church. 1542 Francis Xavier reached Old Goa, the capital of Portuguese India at the time. 1682 Louis XIV moved his court to Versailles. 1757 Battle of Prague – A Prussian army fought an Austrian army in Prague during the Seven Years’ War. 1758 Maximilien Robespierre, French Revolutionary was born (d. 1794). 1816 The American Bible Society was founded. 1835 James Gordon Bennett, Sr. published the first issue of the New York Herald. 1840 The Penny Black postage stamp beccame valid for use in the United Kingdom of Great Britain and Ireland. 1856 Sigmund Freud, Austrian psychiatrist, was born (d. 1939). 1856 Robert Peary, American explorer, was born (d. 1920). 1857 The British East India Company disbanded the 34th Regiment of Bengal Native Infantry whose sepoy Mangal Pandey had earlier revolted against the British and is considered to be the First Martyr in the War of India’s Independence. 1860 Giuseppe Garibaldi’s Mille expedition sets sail from Genoa to the Kingdom of the Two Sicilies. 1861 Motilal Nehru, Indian freedom fighter, was born (d. 1931). 1861 American Civil War: Richmond, Virginia was declared the new capital of the Confederate States of America. 1863 American Civil War: The Battle of Chancellorsville ended with the defeat of the Army of the Potomac by Confederate troops. 1869 – Colonial troops invaded the Urewera. 1877 Chief Crazy Horse of the Oglala Sioux surrendered to United States troops in Nebraska. 1880 – Winifred Brunton, English-South African painter and illustrator, was born (d. 1959). 1882 Thomas Henry Burke and Lord Frederick Cavendish were stabbed and killed during the Phoenix Park Murders in Dublin. 1882 The United States Congress passed the Chinese Exclusion Act. 1889 The Eiffel Tower was officially opened to the public at the Universal Exposition. 1895 Rudolph Valentino, Italian actor, was born (d. 1926). 1904 Moshe Feldenkrais, Ukrainian-born founder of the Feldenkrais method, was born (d. 1984). 1910 George V beccame King of the United Kingdom upon the death of his father, Edward VII. 1915 Orson Welles, American film director and actor, was born (d. 1985). 1920 Kamisese Mara, 1st Prime Minister of Fiji and President of Fiji, was born (d. 2004). 1935 New Deal: Executive Order 7034 created the Works Progress Administration. 1935 The first flight of the Curtiss P-36 Hawk. 1937 Hindenburg disaster: Thirty six people were killed when the German zeppelin Hindenburg caught fire and was destroyed within a minute while attempting to dock at Lakehurst, New Jersey. 1940 John Steinbeck was awarded the Pulitzer Prize for his novel The Grapes of Wrath. 1941 Bob Hope performed his first USO show. 1941 The first flight of the Republic P-47 Thunderbolt. 1942 World War II: On Corregidor, the last American forces in the Philippines surrendered to the Japanese. 1945 World War II: Axis Sally delivered her last propaganda broadcast to Allied troops. 1945 Bob Seger, American singer/songwriter, was born. 1945 – World War II: The Prague Offensive, the last major battle of the Eastern Front, began. 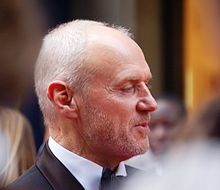 1947 –Alan Dale, New Zealand actor, was born. 1953 Tony Blair, former British Prime Minister, was born. 1954 Roger Bannister became the first person to run the mile in under four minutes. 1960 More than 20 million viewers watch the first televised royal wedding when Princess Margaret married Anthony Armstrong-Jones at Westminster Abbey. 1962 St. Martín de Porres was canonized by Pope John XXIII. 1966 Myra Hindley and Ian Brady were sentenced to life imprisonment for the Moors Murders in England. 1976 An earthquake struck Friuli, causing 989 deaths and the destruction of entire villages. 1981 A jury of architects and sculptors unanimously selected Maya Ying Lin’s design for the Vietnam Veterans Memorial from 1,421 other entries. 1983 – Ingrid Jonach, Australian author, was born. 1983 The Hitler diaries were revealed as a hoax after examination by experts. 1984 – 103 Korean Martyrs were canonized by Pope John Paul II in Seoul. 1989 Cedar Point opened Magnum XL-200, the first roller coaster to break the 200 ft height barrier. 1994 Queen Elizabeth II and French President François Mitterrand officiated at the opening of the Channel Tunnel. 1994 – Former Arkansas state worker Paula Jones filed suit against President Bill Clinton, alleging that he had sexually harassed her in 1991. 1997 The Bank of England was given independence from political control, the most significant change in the bank’s 300-year history..
1999 First elections to the devolved Scottish Parliament and Welsh Assembly were held. 2001 During a trip to Syria, Pope John Paul II became the first pope to enter a mosque. 2002 Dutch politician Pim Fortuyn was assassinated by an animal rights activist. 2008 Chaiten Volcano erupted in Chile, forcing the evacuation of more than 4,500 people. 2013 – Three women missing for more than a decade were found alive inCleveland, Ohio, while a 52-year-old man, Ariel Castro, was taken into custody. 2014 – Six people were injured in a knife attack at a Chinese train station in Guangzhou. You are currently browsing the Homepaddock blog archives for the day Sunday, May 6th, 2018.